Remains of a Byzantine village on the north side of the upper section of Beit Haemek brook. A recommended site for a short hike in the spring time. 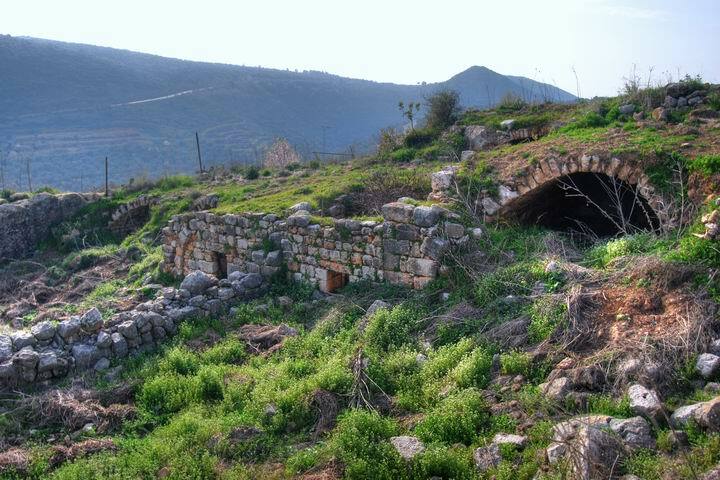 Psalms 107 30:"Then are they glad because they be quiet; so he bringeth them unto their desired haven"
Remains of a large Byzantine village on the north bank of the upper BethHaemek creek. The site is identified in Crusaders lists as "Gastina Mahuz", based on the Arabic name. The site was renamed in Hebrew maps to "Mehoz" or "Mahoz" which means "district". During the spring time (March/April) this site is highly recommended for a short visit, with a easy access close to the road of Tefen. The wild flowers and the blossom of the cherry and almond trees is an intoxicating experience. The site of Khirbet Mehoz is located near the brook called Beit Haemek ("house of the valley"), which flows down to the Mediterranean sea near Shavey Zion. A junction of the modern road (#854) to Ma'alot, Kishor and Carmiel is located nearby. 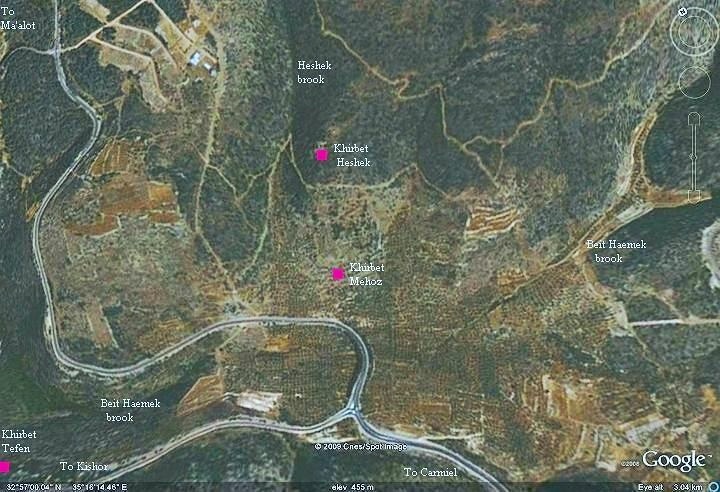 About 200M to the north is another site - Khirbet Heshek. You can point on the purple points to navigate to the selected section. During the Hellenistic period, the area was the western border of the Hasmonean Kingdom. 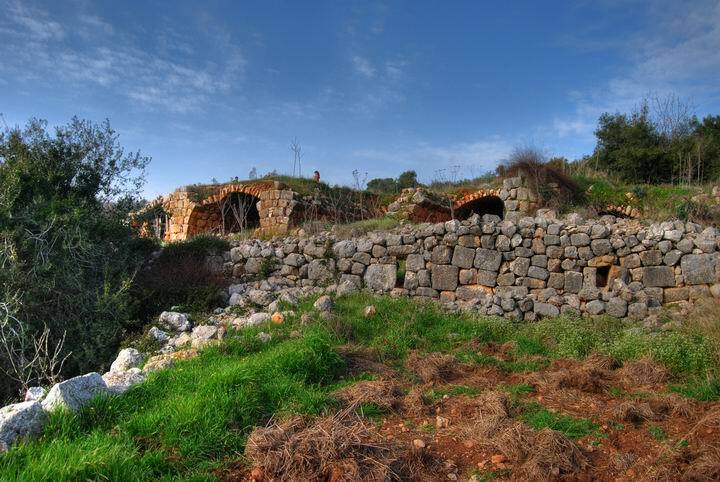 A fortress was built nearby on the other side of the Beit Haemek brook (Khirbet Tefen). 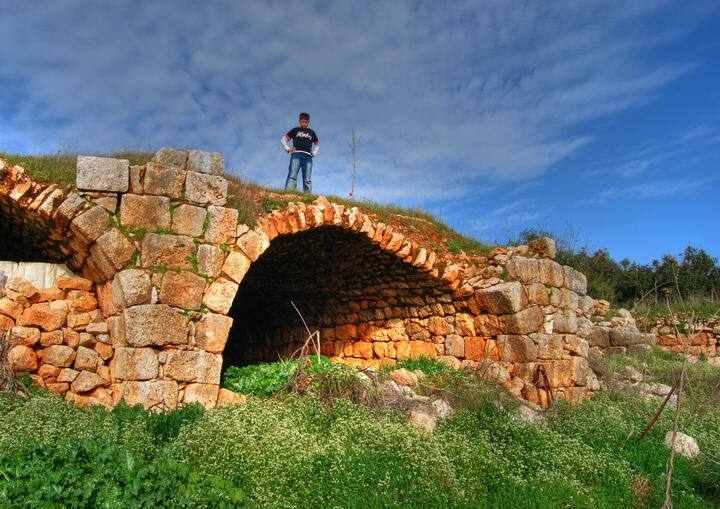 The site was first established in the Roman period, and grew during the Byzantine period (4th-7th C AD). It was a farmers village who grew olive trees and bred sheep and goats. 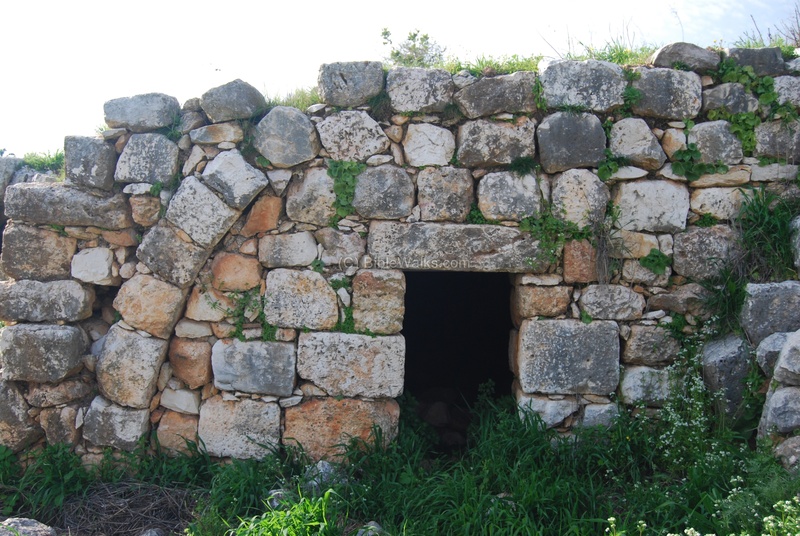 As most of the western upper Galilee villages, this was a Christian village. Two churches were unearthed here and in the nearby village, Khirbet Heshek. Following the Persian and Arab conquests (7th C AD) the village was destroyed. It was still in ruins in the Crusaders period and listed in their archives as a ruined site (Gastina) known as "Gastina Mahuz". During the Ottoman period some of the houses were rebuilt over the Byzantine ruins, reusing their stones. These structures are still standing today but in a bad state. An aerial view from the south side of Mehoz was captured by our quad copter drone. The ruins are located on the top of the hill. Along the foothills are terraces planted with olive and almond trees. The road to the site is seen below. The ruins of the village are located on the hillside which is seen in the center of the background. You can park near the main road and climb up the hill, and after 200-300M reach the ruins of the ancient site. After a short climb you can see a high concentration of the ceramic shreds that are scattered around the site. Behind is a hole of one of the cisterns. On the south side of the site is an area with a 20m2 water reservoir and number of structures. There are steps that descend down to the bottom of the reservoir. Near the pool are a number of arched structures. These structures were in use during the Ottoman period, and were built over Byzantine period ruins. A Byzantine church with a mosaic floor was found under the ruins of the Ottoman period structure. The entrance to one of the arched rooms is seen in the photo below. A view of the arched room is seen below. 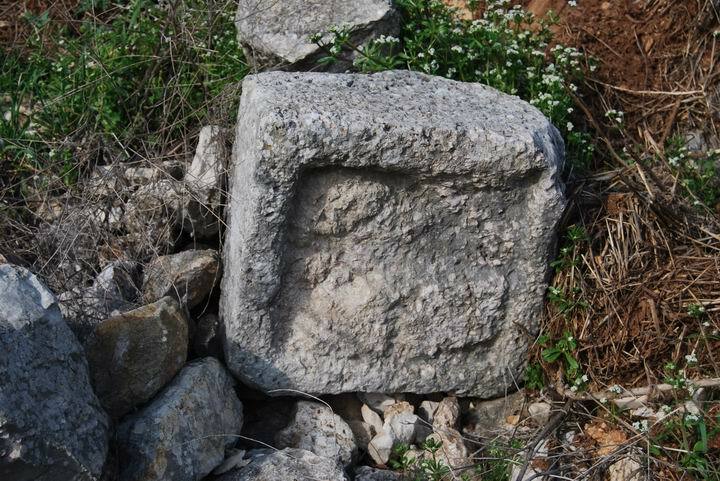 An interesting carved-in stone lies near the structure, and may have been part of the church. To the north-east of the reservoir are the remains of other structures, such as seen below. A closer view of one of the structures. Further north up the hill are other remains of Ottoman period structures and walls, also built over Byzantine period ruins. A closer view of the arched rooms. The boy was visiting the site with his family, who came for a picnic during a sunny spring afternoon. This is a great place to spend the weekend. Just keep an eye on the children - there are open cisterns around. A view from the roof of the structure to the south. Yet another view of the structures. 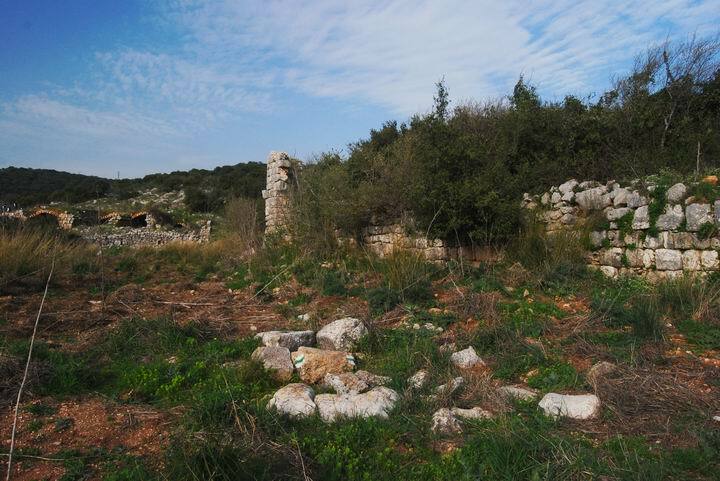 An Ottoman period sheepfold is located on the eastern side of the site, where more ruins are scattered around. The following nature photos are sample of the flowers and trees around the site. The pink flowers above are called "Ricotia Brassicaceae" ("Carmelite Na-ah"). They are named as such since the delicate flowers, which grow among the rocks in most of the Galilee and near the Carmelite monastery, are cross-shaped and resemble Carmelite crosses. Olive trees and wild flowers are seen below. There are also the red and purple Kalanit flowers (anemone flower). The rare Nazareth Iris also flowers here. Almond trees are also seen in blossom in early spring. A flight over the site can be seen in the following Youtube video. Khurvah (Horvah, Horbah )- Ruined site in Hebrew. Biblical references: Leviticus 26,31: "And I will make your cities waste,...". Isaiah 44, 26: "...and I will raise up the decayed places thereof. 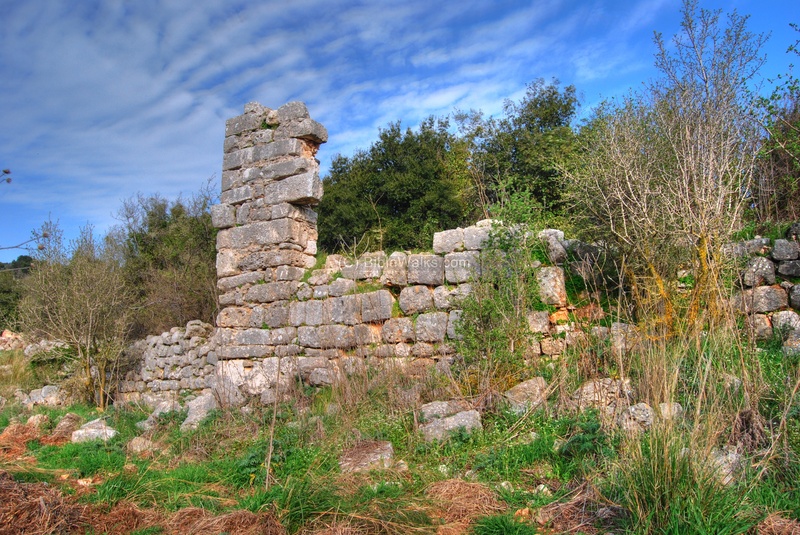 Gastina - ruined settlement in Latin. In the Crusaders accords the site was named Gastina Mahuz. Mehoz/Mahoz/Machoz - Hebrew: district. In the Bible the word it appears in Psalms 107 30 (was translated to "haven" in KJV: "Then are they glad because they be quiet; so he bringeth them unto their desired haven"). Beit-Haemek: Hebrew: "House of the Valley". This brook crosses the west upper Galilee, and flows to the Mediterranean sea near Shavey Zion. Biblical reference: the eastern border of the tribe of Asher (Joshua 19 27): "...toward the north side of Bethemek".